Well, there&apos;s a new, new, new Victoria&apos;s Secret Angel in town: On Wednesday, Grace Elizabeth announced that she has finally earned her Victoria&apos;s Secret Angel wings. 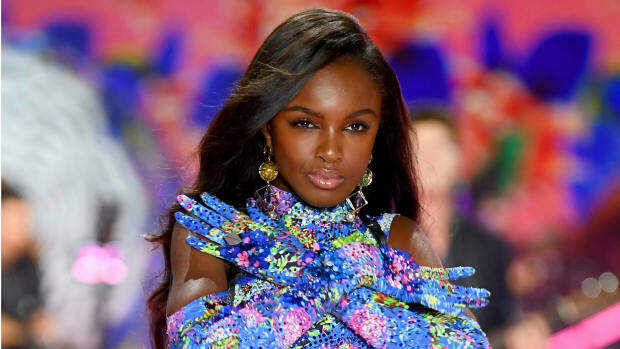 The 22-year-old Florida native made her Victoria&apos;s Secret Fashion Show runway debut back in 2016 and has been serving as a Pink spokesmodel ever since. In addition to her work with Victoria&apos;s Secret, Elizabeth has established herself in the social media supermodel stratosphere thanks to ad campaigns with Estée Lauder, Versace, Chanel and MaxMara, as well as covers for the likes of Vogue Italia, Vogue Paris, InStyle and V.
It&apos;s getting a little tricky to keep up with all of the newly inducted Angels. Back in 2015, Victoria&apos;s Secret brought on its largest-ever class of Angels, announcing 10 new spokesmodels at once. It seems the brand has decided to take a different approach for its latest batch, rolling out the announcements of new Angels every Wednesday over the course of several weeks; Elizabeth joins fellow new Angels Barbara Palvin, Alexina Graham and Leomie Anderson. It&apos;s a bit strange for Victoria&apos;s Secret to bring on so many contract models at the same time; this new addition brings them up to a whopping 16, barring any thus-unannounced retirements. It&apos;s a far cry from a time when the Victoria&apos;s Secret Angel title was kept to a tight group (and one that made its models multi-millionaires). But then, the company has fallen on some truly tough times. The latest in an avalanche of bad news: On Tuesday, Moody&apos;s Investor Service downgraded L Brands&apos;s outlook from "stable" to "negative" due to Victoria&apos;s Secret&apos;s performance. It seems these new Angels&apos; wings come with a little bit of extra weight.